Hougang first captured my imagination in 1991 when it unexpectedly rejected the incumbent MP, Tang Guan Seng and voted in Low Thia Khiang. I was watching the results on television and had not anticipated anything to come out of the Hougang contest as there were other more publicised fights. I was then fresh out of university and beginning my long journey of political awakening. Hougang returned Low Thia Khiang as MP again in 1997 and 2001, despite the now infamous strategy of linking votes to PAP with estate upgrading. The upgrading carrot grew bigger in 2006. Even as a politically neutral Singaporean then, I could not stand such unfair behaviour and wrote a critical piece to The Straits Times Forum. I was relieved when both Hougang and Potong Pasir rejected the upgrading carrot. I detest unfair fights. Such bravery was abstract to me then, as I did not live in either constituencies. I cheered them from a distance. I shared emotional links with these two constituencies, pride that there were defiant groups that dared stand up to the mighty ruling party and pride that Singapore had people-centred opposition MPs that held the hearts of the residents despite intense and unfair competition. It was hard then to feel as Hougangers do, because I did not live there nor participated in the hustlings. 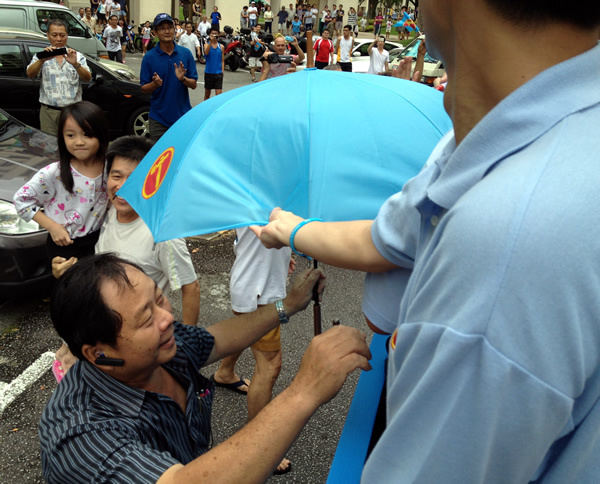 Going through GE2011 as a newcomer, I was caught up with my own campaign in Joo Chiat SMC. It wasn’t until By-Election 2012 that I felt the Hougang spirit strongly. The crowd were fantastic at the rallies, vociferously cheering us in our speeches as they did in GE2011. The people were very friendly during our house visits. However, it was the heavy downpour during the rally night of 22 May that made me realised the sterner stuff they were made of. Those who had no umbrella stayed on, even the old and the frail would not move. People were sharing umbrellas, plastic sheets, newpapers and cardboards with one another, even with strangers to use these to shield off the relentless rain. The celebrations in Hougang were spontaneous when the result was announced at around 10:30 pm. 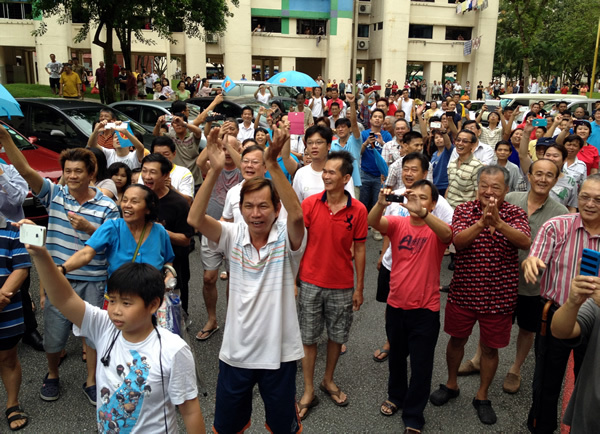 Hundreds or even a thousand had gathered around each of the popular coffeeshops in Hougang. The people celebrated the announcement as if we had just won the World Cup. The Thank You parade was yet a different and immersive experience. We started off in the cluster of flats around block 701. A good crowd had already gathered and chatted with us before we set off. At each block, people would come out to the windows and corridors and waved to us. Some waved blue flags, blue umbrellas, inflatable hammers and even real hammers. Some shouted “Workers’ Party” or “Huat ah!” from the windows. A primary 5 boy from Punggol Primary who had earlier had his photo taken with each of the MP / NCMPs followed our pick-up to all the different blocks to cheer us at every turn. He must have trailed us for at least 30 minutes. 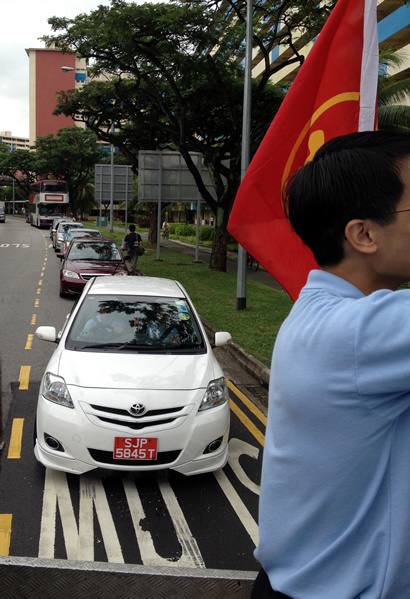 At every traffic junction, there were loud horning, waving from wound down car windows and the occasional cheer. At one traffic junction, a man pulled beside us and chatted with Low Thia Khiang like old friends. A possession of cars sometimes followed us, happily honking away. The mourners at a wake along Avenue 7 were amazing. They heard us from afar, rushed out and started cheering for us. As our pick-up drove past, one came forward and shook hands with us. I could not imagine that even in their mourning, they would pause to cheer for us. At several clusters, people had heard we were coming and had gathered. The first major crowd was at Block 309/310 where several hundred people came forward, shook hands, cheered and several asked for autographs on umbrellas and flags. The most unforgetable moment was along Avenue 5, outside block 322. A crowd of several hundreds, maybe a thousand had gathered, waiting patiently for us. As we approached, they poured onto the road, oblivious of traffic around them. We stopped and celebrated with them. The people were so reluctant to leave. Volunteers had to steer them out of the traffic’s harm while we inched our way out of the area. We continued through to every turn and corner in Hougang SMC, into dead end lanes and tiny carparks, and into every public and private housing area. At every turn, residents would come out to greet us. Low Thia Khiang would occasionally call out a resident by name. By 3:30 pm, we were done for the day. The Thank You parade left me with lasting memories. The type of warm and spontaneous support was simply unimaginable. The cheering, clapping, singing and even dancing came from their hearts. The parade completed my journey through Hougang. What started for me in 1991 as a distant spectator of the fight for democracy has now become a part of me. I had experienced first hand their long and determined fight to keep alight the fragile flame for a fairer democracy despite huge disadvantages stacked against them. I am now an active participant in this fight. It’s a surreal feeling as I stood on the pick-up, soaking in what this long journey since 1991 had meant for me. After the WP victory, The Straits Times commented, “Hougang speaks, but for itself”. Does Hougang speak only for itself? In 1991, perhaps so, then along with 3 other constituencies. The crowd at the rally did not come from just Hougang. It could not be. The crowd on the last rally night would have equalled the total number of voters in Hougang. 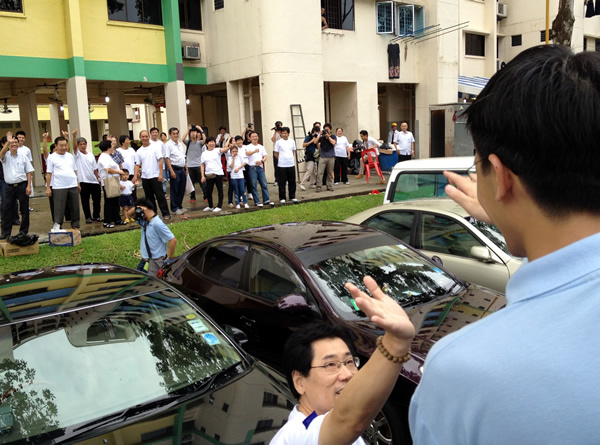 No, they came from afar to cheer Hougang voters on. Hougang perhaps spoke ahead of its time. It was so in 1991. Then, it spoke to me to plant the seed of political awakening in me. Its flame eventually spread to Aljunied GRC in 2011. In 2011, I witnessed an outpouring of support for the opposition that I could not have imagined in 1991. From the man in the streets, to vocal voices in the cyberworld, to professionals, businessmen and even civil servants, the fear factor and political apathy appear to have been broken. Perhaps in 2012, Hougang is again speaking, ahead of its time for all Singapore. It is perhaps speaking ahead of its time for a more inclusive political landscape and a more inclusive society. Thank you, Hougang. Selamat malam, pengundi pengundi Hougang. Malam ini, saya mengucapkan terimah kasih banyak banyak sebab pengundi pendungi hadir ke rally ini. I will next speak in English. Recently, Professor Lim Chong Yah, former chairman of the National Wages Council and now Professor Emeritus of Economics at Nanyang Technological University made a strong proposal. He proposed to raise the wages of low income workers by 50% over the next 3 years and to freeze the pay of the top income earners. The Workers’ Party is also concerned about income inequality in Singapore. For someone like Professor Lim who was previously in the innermost circle of government policymaking to raise this issue, it shows that this problem has grown really big, very very big. It shows that the PAP has gotten some things really wrong. Instead of looking at the problem, one minister after another including the minister who is supposed to champion the welfare of workers dismissed the proposals as impractical. Professor Lim had to remind them that we are not talking about workers and not about cattle. Maybe the PAP expects workers to “做牛做马”, that is, work like cows and horses for pittance. Now who has a heart for the workers? Is it our highest paid ministers in the world? Do they think there is a problem for those who cannot have wages enough for daily living despite working day and night? They all sang the same tune that we need to get our productivity up first. Last year, the Economic Survey of Singapore reported that even when productivity had risen in the past, wages in some industries did not move up as they should. There’s no assurance it would. Low income workers in certain industries have had their wages stagnate for more than 10 years already. Productivity is important but it alone cannot determine the fair wages. Wages are also affected by government policies, like immigration. When the government flooded the job market with foreign workers, no matter how hard you work, your wages will still stagnate. That was what happened in the last ten years. Another important reason is that it is difficult to increase productivity in some low wage industries. How many more hours can a security guard work, how many more trips can a bus driver make before we can say their productivity have risen to a level that they deserve a pay rise? More and more of our frail and elderly continue to work way way past retirement age. How much harder and longer must they work? Naturally, Singaporeans are protesting. Finally, after 28 long years, the National Wages Council yesterday recommended a $50 increase in wages for those earning $1,000 and below. That’s barely keeping up with inflation. Speaking of inflation, cost of living is getting higher and higher. Yesterday, the headline inflation was 5.4%. Inflation has been stuck at around 5% for quite some time already. While we can say inflation is due partly to higher prices of oil and goods from overseas, inflation is also caused by higher rents. Who is the biggest property owner in Singapore? Is it not the government, directly and indirectly through companies it owns? Who benefits from high COE prices? These are adding to the inflation. The government likes to boast about Singapore being ranked top in all sorts of things. Well, amongst developed countries in the world, we are have the 2nd highest income inequality. Even Singapore’s Ambassador-at-large, Professor Tommy Koh described our ever widening income gap as “socially unconscionable”. We are now the 9th most expensive city to live in according to the Economist Intelligence Unit. Eleven years ago, we were ranked number 97. Congratulations, we are now top in another area. Two nights ago, here in this rally site, I was moved. I was very touched by how you stayed even when the rain poured. You stayed on and displayed generous spirit in using whatever you had to shelter one another. Even the old and the frail stayed on. You cheered in the rain. You danced in the rain. We are in the same boat together, come wind, rain or shine. The PAP however, seems to have taken a different boat, a luxury liner, headed for a different direction. It seems hard for them to know your problems because they are not in the same boat as you are. Voters need to continue to send the message to the government to put themselves into the shoes of ordinary Singaporeans and feel their pain. The last elections, you gave them a stern warning. They started to do a bit more. If they win Hougang, they will stop listening again. Today, the Prime Minister said Hougang should vote for a fresh start. I think the PAP should itself first make a fresh start. The PAP should have a fresh start today NOT to divide the country up just because some constituencies chose to vote differently. Look at your IC. You have a pink IC, just like every Singaporean. You and your sons served National Service. You pay taxes. You helped build this country. The Prime Minister says the voters of Hougang should reflect. The PAP should instead reflect on why the people are so angry. Do not divide the country up when people vote differently. Do not divide the country up by holding off resources to opposition wards, resources that belong to all Singaporeans. The PAP should make a fresh start to be inclusive. If Desmond Choo really has a heart for Hougang, if the PAP has a heart for Hougang, then work together for the benefit of Hougang residents, not cut off national resources from the opposition. Give your vote to the Workers Party! Give your vote to Png Eng Huat ah! Thank you. The feeling was beyond description. The rain came, swift and furious just after 9 pm. It started as a small drizzle and then it poured. And it poured. The huge crowd, probably 10,000 or more stayed. Umbrellas popped up. 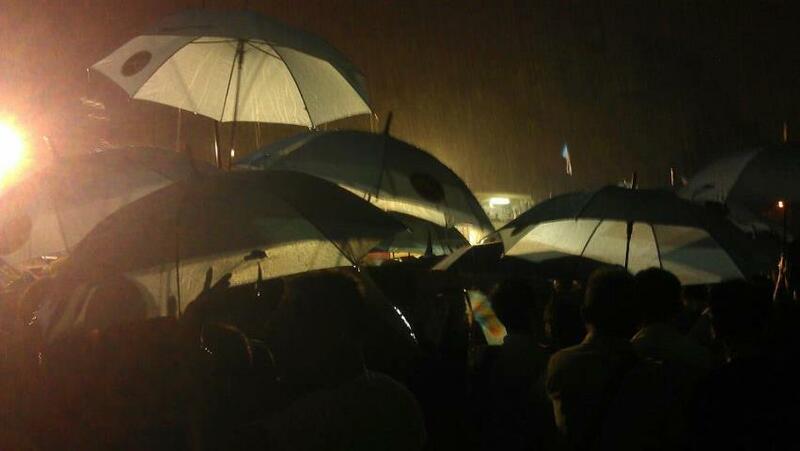 Strangers shared umbrellas with one another. They shared with one another anything they had to shield themselves from the rain, be it cardboards, plastics, papers or umbrellas. 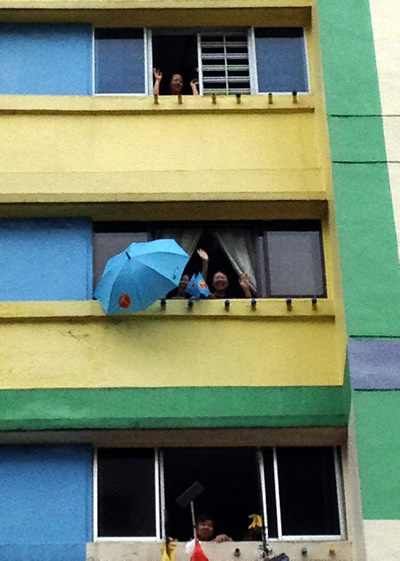 Some moved to the void deck of the nearby blocks of flats to continue to listen. But most stayed on the field, some without any umbrellas or cover at all. They cheered as they always did, perhaps louder than even before the rain came down. They came, without any buses to transport them in. They came, without any free food or prompting by others to do so. They stayed, rain or shine. Nevermind the soggy field. Nevermind the wet clothes. Nevermind even the occasional breeze that magnified the cold. We were soaked through and through on the stage. I could hardly see through my rain-splattered spectacles. Our clothes were stuck onto our skin, fused as if one. The speakers must have had a hard time; their scripts soaked through; the pieces of paper stuck together. You, the supporters are our inspiration. The rain came down hard. No matter. You stayed. You inspired us on. The journey ahead for the work we must do may be like that. There will not always be sunshine. The rain may come swift and heavy at times. There may be troubles from outside; there may even be troubles from within. Being an under-dog in a skewed political environment is never easy. There are detractors who say we are disunited. Yes, there may be individuals whom we cannot please, but we must move on. We will draw inspiration from you, the supporters. For you, we will progress. For you, we must progress. I heard an interesting interview on FM 93.8 LIVE today in its “Small Talk, Big Returns” show. It was an interview of a Ms Sylvia Fernandez who practices motivation and leadership development using the methods of book author and leadership consultant Aubrey C. Daniels. The interview struck me because I share the sentiments expressed by Ms Fernandez. She cited the example of Enron, the failed US Energy giant. It had a model of paying top dollars to buy top talents into the company, talents being defined narrowly by bright people with high academic achievements. They quickly learn the behaviours of the company and propogate the same behaviours because the leaders were looking for people who would exhibit the behaviours they wanted. Enron had over relied on a small group of intelligent people with bright results while ignoring the rest. She said that while we should pay for talent, we should never undervalue the rest. Develop people, help them grow organically. Turn your organisation focus inwards too. There are talented people inside, even if they do not have the academic qualifications or perceived high IQ that some from outside come with. Identify people, take them up, reinforce them, inspire them to do more and make them fly. This will lead to great productivity gains in the company. Inspire people in your organisation to do more. There are a lot of misplaced and demotivated people in organisations. We need to take them from mastery of whatever areas they are already in, into fluency, even if it takes many hours of patient training and cultivation. She cited studies that showed that exceptional performance and IQ does not have a strong co-relation and hence we should not be overly focused on just getting people with bright results and assume they can do exceptionally well in the organisation. I recall my own experience as an entrepreneur growing a start-up, patiently growing from a 4-man company into a sizeable player in our industry. We started to grow rapidly only when we looked for talents internally, identified highly motivated individuals and gave them challenges to grow the areas they were in, or even create new areas which we allowed them to run with autonomy. They were not people with sterling academic results. In fact, one who rose to later lead the software development team orginally graduated from a vocational institution. The one who rose to manage sales and eventually the company’s entire operations originally had a polytechnic degree in a non-related field. They had started from the most junior positions in the company. Most of the rest who rose to key positions had started from the junior ranks, mostly with unimpressive academic results. They impressed with their exhibited self-drive and desire for continuous learning. This is not to say we did not value those that came with good academic qualifications. We had some with good academic results who did well too. The point is that many organisations follow too narrowly on the model that people with solid academic results are automatically talent and should be fast-tracked to leadership roles. So I could immediately identify with what she spoke about. In this age when we need to raise productivity in organisations greatly to stay competitive, we need a different mindset in the way we identify, cultivate and motivate people. Only then can we get quantum leaps in productivity. 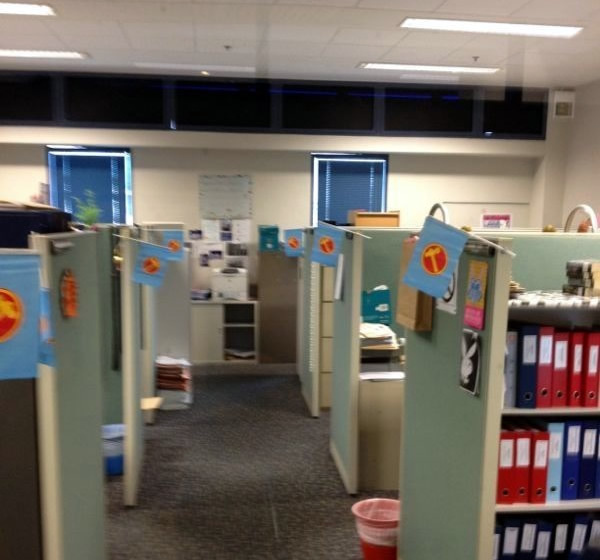 You never know what gems there are in your organisation until you start to look inwards. Organisations that were successful in the past may become entrenched in their own past success that they start to identify only people who follow their same mould and forget how to reinvent themselves for the future, just like Enron. So we also need to be open-minded about our definition of talents and guard against in-breeding. The PAP likes to talk about their track record in running this country. Let’s look at their ‘Track’ record. Their ‘track’ record has being questioned at the Commission of Inquiry into the breakdown of MRTs. And when the Inquiry was still ongoing, we had more train breakdowns. Old lines break down. New lines also break down. Straight line, circle line, North-South, East-West, North-East, MRT, LRT; they break down too frequently! What a ‘track’ record. Ex-PAP MP Mr Peh Chin Hua, in his PAP rally speech on Sunday described my fellow NCMP Gerald concerns about MRT breakdown as ‘BS’ (i.e. 牛粪), an uncouth term. Are the MRT problems you are experiencing ‘BS’? Is PAP so disconnected from ordinary Singaporeans that they brush off the problems as unreal and ‘BS’? Are they really listening to you or taking feedback as simply ‘BS’? The PAP runs the country with a profit maximising mindset. It sees the country as a large company which they think they own. They say they have been divesting their businesses after the Economic Review Committee in 2003 criticized the government for being in too many businesses. So they decided that JTC should divest its factory spaces. These factories had helped Singapore grow since the 1970s by providing affordable industrial rents for many local companies. JTC has since sold almost all of its industrial space, mostly to Mapletree Logistics, another Government Linked Company. I don’t think passing the business from the left hand to the right hand can be called a divestment. It is a rent maximising exercise to extract better rent from the SMEs. Industrial rents have shot up, forcing companies to charge more to cover costs. The government is also a large owner of retail spaces through the many Real Estate Investment Trusts that it owns. Retail rents have been rising too. In the end, Singaporeans pay the price when our cost of living shoots up. From GST to COE to ERP to public housing to restructured hospitals, the mindset of value maximising has generated a lot of money for the government. SMRT is an example of how becoming so focused on shareholder returns can lead one to forgot its core mission of safe and reliable public transport. Essential public services for our people cannot be treated as business commodities to maximise returns. They are moral responsibilities of the government! We the voters need to remind them through the ballot boxes that the country does not belong to just a few elites who thinks they know how best to run this place. Singapore belongs to all Singaporeans! When the PAP make mistakes, they quietly dismiss them. They will tell you … It’s once in 50 years. When a terrorist escapes, it’s an honest mistake. When trains breakdown, it’s “a rare confluence of factors”. Well, problems are not rare in Singapore anymore . Why are our new ministers for national development and healthcare so busy building flats and hospitals now? Maybe someone before them should have listened more to the problems of ordinary Singaporeans and worked harder? It took you, the voters to make them wake up last year. Your vote is important. Your vote will tell the PAP that they need to listen more to you. Come 26 May, vote The Workers’ Party! Vote Png Eng Huat ah! I will now speak in English. One of our important functions in parliament is to raise questions that are important to Singaporeans. One of the issues I had raised as a new member of parliament is about foreign scholarships. I have long wondered about how many foreign scholars we have, how we integrate them into our society, and how they have contributed to Singapore. In January this year, I asked a question in parliament about the number of foreign scholars we have and their academic performance. The answer I received was that each year, Singapore gives 320 scholarships to ASEAN students. I was puzzled. I checked my question again and it clearly asked about the number of foreign scholars and not the number of ASEAN scholars. Why was the complete information not given to me? So I asked again in February. This time, they disclosed that MOE gives out another 1,700 scholarships to scholars from India and China. When you add up these numbers, we have more than 2,000 new foreign scholars each year. A scholarship is usually for 4 years. This means that at any time, we could have around 8,000 foreign scholars, sponsored fully by our Singapore government. Based on an average of $18,000 spent per scholar a year, I estimate our government could be spending about 144 million dollars each year on foreign scholarships. This figure excludes foreign scholars sponsored by government linked companies. I asked further and found that one third of universities’ foreign scholars graduate with worse than 2nd upper honours degree, the typical standard expected of all scholars. Scholars are supposed to be the cream of the crop so I am disappointed that a large percentage of MOE foreign scholars are not getting the minimum results. Many of our pre-tertiary foreign scholars go to other countries for their university studies, never to return as they are not bonded to work in Singapore. The university foreign scholars are bonded but there are those that do not complete their bond or leave as soon as their bond is over. So I seriously question how effective our foreign scholarship policy has been, given the huge amount of money spent each year in this area. Our foreign scholarship policy has been in place for over 3 decades. That’s over 30 years, a long period of time. I think we may have given out too many foreign scholarships too easily in the past, without ensuring all scholars are of the right academic quality and more importantly, to try to integrate them into our society so they will want to be part of us and contribute to our long term growth. The government has set a quota for the number of foreign students in our local government funded universities. We pride ourselves that our universities are highly ranked in the world. I do not understand why is it then that we need to give so many scholarships to attract foreigners to study here. Since we have world-class universities, people should pay money to come to Singapore to study. After all, most of us will have to fund our children to study either in our local universities or overseas. And we all know that the cost of tertiary education in Singapore has been constantly rising. Our universities, polytechnics and ITE just had fee increases this year. Every single one of them. The Workers’ Party will continue to question the PAP and hold them accountable for the policies they have put in place, to ensure that our resources are well used and that Singaporeans as a whole will benefit. 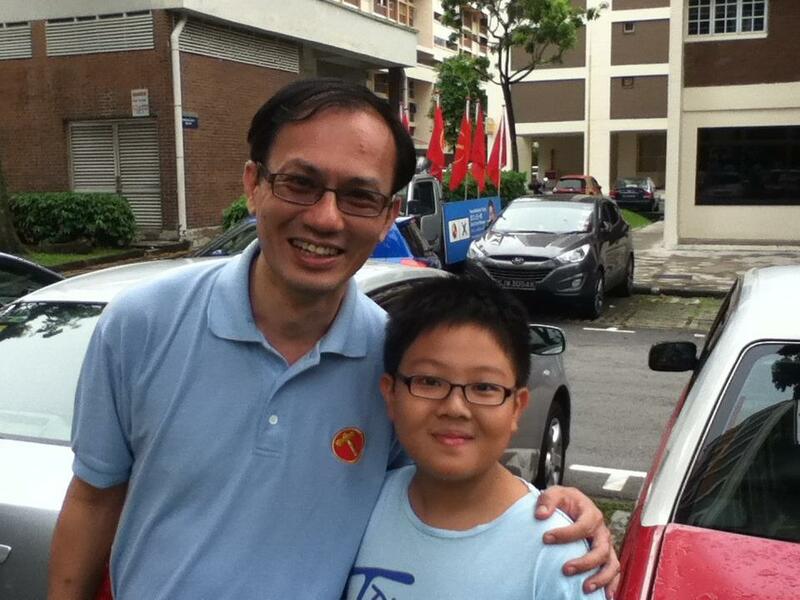 I know that if elected, Png Eng Huat will add strongly to our voice to check the PAP. I look forward to having him as my parliamentary colleague. Your vote is important. Every vote is precious to us. Vote The Workers’ Party! Thank you!